It was in the year 2001 that the Bishop of Nalgonda Rt. Rev. Govindu Joji invited the Vincentian fathers to his diocese. He requested to begin an English Medium School and also a boarding at Kethapally. The then Provincial Rev. Fr. Jose Aikara and his council decided to take up the request of the bishop and begin a school for the development of Catholic children and other of the area. Fr. Vincent Edakkarot was entrusted with the work and began the school. On 23rd March, 2002 the foundation stone for the school was laid and on 23rd September 2002 the building was blessed by the bishop and inaugurated by the Provincial. 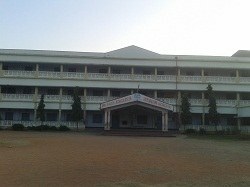 At present, the school has classes from LKG to X standard with 490 students on roll. The school has secured recognition from the state government. The boarding has around 40 inmates. At present the sisters of St. Joseph of St. Mark of Indore province are also helping us in the administration of the school and running of the hostel for girls. on 24 october 2012 vincentians were entrusted with Kothepetta parish. Fr. Saji Njarakal was the first parish priest.